Infertility has been on a steady rise among men and women in the last few decades. This is a subject of great interest to me because in my own Ayurvedic practice as a nutritionist, I treat infertility with a very high success rate, applying diet, lifestyle, herbs and shirodhara (Blissful Mind Massage). The information I am sharing in this newsletter will be very helpful for you to convey to your female and male clients the immeasurable balancing benefits of Blissful Mind Massage (shirodhara) when addressing infertility. Scientists are recognizing the relationship between what Eastern cultures have referred to as the ?third eye?, and the hypothalamus, pituitary and pineal glands? situated deep inside the brain. ?The exact area Ayurveda has always identified as the seat of the third eye, and which is the focal point during Blissful Mind Massage therapy. The hypothalamus, pituitary and pineal glands are in charge of the production of most of the hormones in the body?including reproductive hormones.? The follicle stimulating hormone (FSH) is a very important reproductive hormone secreted from the pituitary gland?into the bloodstream. 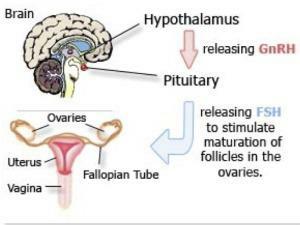 In women, FSH stimulates the growth of ovarian follicles in the?ovary before the release of an egg at?ovulation.? Without FSH ovarian follicles do not grow properly and do not release an egg, thus leading to infertility.? In men, FSH is required for proper development of the testes and sperm production.? Normal levels of FSH are needed for fertility in both men and women.? When FSH is either too high or too low it will greatly lower chances of pregnancy. Raised levels of FSH are a sign of malfunction in the ovary or?testes. In a female it indicates that she is entering?menopause, even during fertile years. Diminished secretion of FSH manifests in males as failure in production of normal numbers of sperm. In females, cessation of reproductive cycles is commonly observed. Now that we know all this, it is no wonder that Ayurveda treats infertility and so many hormonal imbalances focusing on the head with shirodhara therapy.Specific medicated oils, or milk products, are used, along with head massage and a rhythmic movement of the liquid over the forehead to bring the mind into a meditative-like state. This process stimulates the hypothalamus, pituitary and pineal glands 'third eye' and creates proper communication between the hypothalamus, pituitary and pineal glands to secrete adequate amounts of hormones, including FSH. It is important to be able to explain the scientific meaning behind this healing Ayurvedic therapy powerhouse.